Club Farret is an excellent family run campsite that occupies a wonderful location and is part of the acclaimed Yelloh Village group. The campsite covers an area of around 14 hectares and as you’d expect from a member of the Yelloh Village group is both well maintained and beautifully landscaped. Trees, flowers and plants are well located throughout the campsite and the range of facilities and activities on-site are second to none. One of the great things about Club Farret is its excellent location. The campsite is near to Vias-Plage which offers a great range of activities, bars, restaurants and shops and there are also some great places to see and things to do nearby including the Cap d’Agde aquarium, Aqualand and Europark which boasts the largest roller coaster in the south of France. Club Farret’s location is also perfect for those who prefer to leave their car behind when holidaying. The airport at Beziers is just 10km away and there are a variety of different flights available from UK airports meaning that you can literally hop on the plane and be in the south of France within a couple of hours. The campsite is highly popular with families for a number of reasons, however the main one is the fact Club Farret boasts direct access to a beautiful soft sandy beach where the warm sea laps against the shore and children can be heard playing and enjoying themselves. Perfect for a family holiday, Club Farret not only benefits from a great beach. 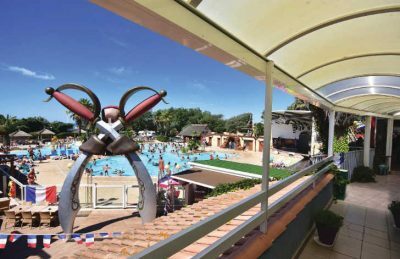 On site you’ll also find a wonderful, pirate themed swimming pool complex which offers 2 swimming pools, water fountains, bridges, a sauna, jacuzzi and spa although please note that there are no water slides. Club Farret campsite offers a comprehensive selection of activities and facilities on site and also nearby to ensure you have a fantastic family holiday. On-site activities at Club Farret campsite include table tennis, tennis, football, volleyball, basketball, gym, mini golf, boules, playground and cycle hire. Facilities available at Club Farret campsite include WIFI, restaurant, takeaway, bar, groceries, games room, tv room, animation team, washers and dryers. Accommodation at Club Farret campsite includes a range of 2 and 3 bedroom mobile homes that are available from Eurocamp and Al Fresco Holidays.